My friend and I were lazily flipping through her Netflix “watch-instant” selection when I caught sight of something familiar: the cover image of my one of my favorite books! I was so excited that it was the first thing I watched when I got home (my friend was not in the mood for “anything serious” at the moment). 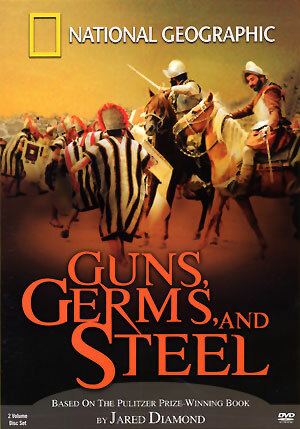 The documentary is an adaptation from Jared Diamond‘s phenomenal book, Guns, Germs and Steel. It has been one of my absolute favorites and most recommended books since I first read it at 17. This was often the book I’d (very) enthusiastically gush about whenever patrons at the local bookstore I used to work for asked, “What do you recommend?” I must have sold dozens! If you’ve ever wondered, like me, why certain civilizations managed to conquer so much of the globe and how the society we know today was shaped, this is a great launch-pad. I’d highly recommend this for your personal edification or perhaps as a gift for that history buff on your list! You can watch this even if you don’t have Netflix or can’t wait to see when it’ll air on PBS. Catch it on Google-Vid here.